I was planning to spend the afternoon in Grimsby with mates I had met up there. So when the opportunity came to go to Rotherham United Reserves v Grimsby Town reserves, the opportunity was too good to turn down. It was to be played at Parkgate FC, a ground that I had taken pictures off, but not seen a game at. I only learned of the game on a forum on Monday evening, so this was a real bonus, making it 9 games in 7 days on my week off. My sat nav reckoned a 2-hour trip go Grimsby, so I left my hotel shortly before 10, arriving at Grimsby at just before 12 as arranged. It was then an hour and a half drive to Parkgate. I'd actually only found out about the game by chance as I was unsure where I would be going that evening. Originally I had been planning to go to Barton Old Boys v Retford United in that evening, but their game had been called off due to Retford's county cup commitments. But then they had a game rescheduled against Bottesford Town in the Lincolnshire Senior Trophy Semi-Final, so it was back on. My backup plan was Askern Villa, a team a league below, in Bottesford's league and based near Doncaster. I got into Grimsby just before 12 and waited for my mate William. I had a look in the local cash converters to pass time but soon we met up and were on our way. We got to Parkgate FC, near Rotherham at 1.20 with plenty of time to spare before kick off. So we stopped at a local chippy and got a pretty generous portion of chips for £1.50. We then drove to the ground and sat in the car eating our chips as it was freezing outside. It cost nothing to get in, but I did pay 20p for a teamsheet. The game kicked off at 2PM. It was a young line up for both sides, with me not recognising any of the Rotherham squad. I did notice Frankie Artus, Andy Thanoj and Dayle Southwell from my game on Football Manager that I played on my Android tablet last year. 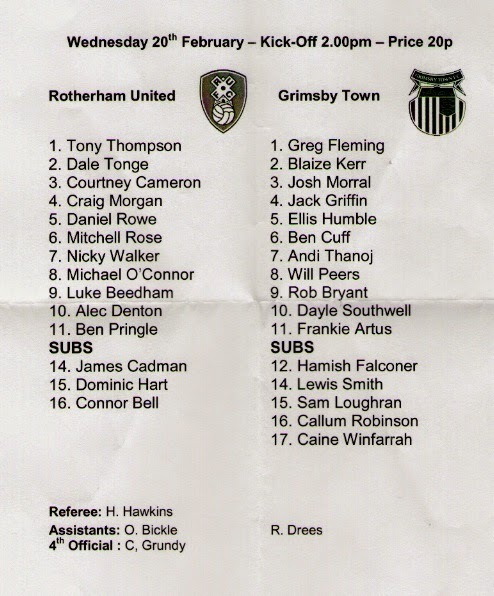 I took the Grimsby side to the Championship on that game, most of it played whilst I was on holiday in Portugal. This game was slightly less exciting. Grimsby had the best of the opening 10 minutes of the game, but then Rotherham had a breakaway and scored from that. From then on the home side controlled the half, forcing several good saves out of the Grimsby keeper Greg Fleming. At half time I went back to my car to change into my work shoes as they were warmer. Also, I got my scarf and gloves on. The second half continued with Rotherham dominating, but Grimsby were starting to get back into it more. Dayle Southwell got the equaliser after around an hour, and from then on Grimsby were the better side. Southwell even had a chance to score a last minute winner from the penalty spot but his effort was saved by Tony Thompson in the Rotherham goal. So although it had not been the best of games, it wasn't too bad. And I had enjoyed it in good company. After the game we made our way to the next game at Barton Old Boys, stopping at Brigg Town on the way to take photos. THE ROUNDWOOD SPORTS COMPLEX is a pretty decent non-league ground for the level that Parkgate play at, this is currently the Northern Counties East League at step 5 of the Pyramid. The ground is mainly uncovered. Unusually, the main stand is behind one goal, this is where you go in. There is a small covered standing area too, both areas holding around 150. Along the dugouts side, there is another small area of cover, holding another 150-200, this is where I chose to watch the game from. There is a small tea bar at the ground, which serves basic stuff, I am unsure of club shop or clubhouse details as it was only a reserves game. There are shops nearby, and pubs too, but not a huge amount of choice. Sadly I lost the photos I took of the ground on the reserves visit, luckily I had visited previously though the ground has changed slightly. I also made a subsequent visit in April 2015 when Parkgate lost 2-1 to Parkgate, but again I don't have the photos.